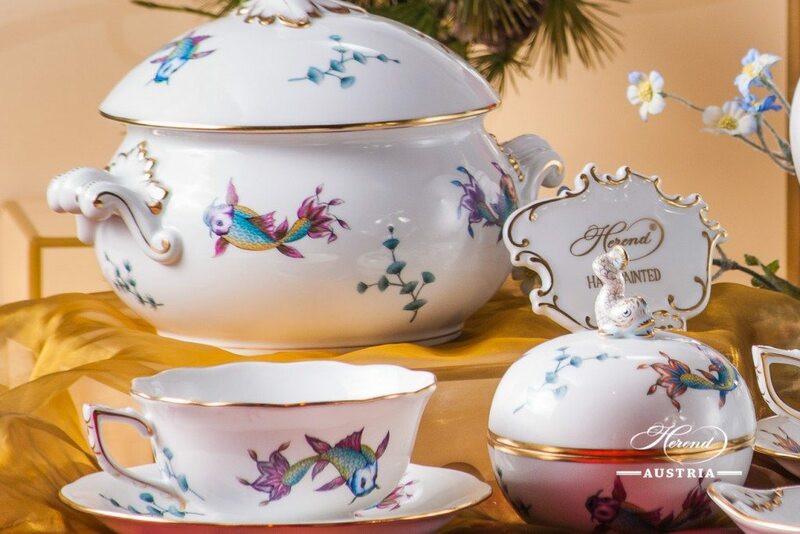 This is a New Herend ornament emanating an ambience of airiness, painted with little colouring and an aftertaste of “à la Chinese”. 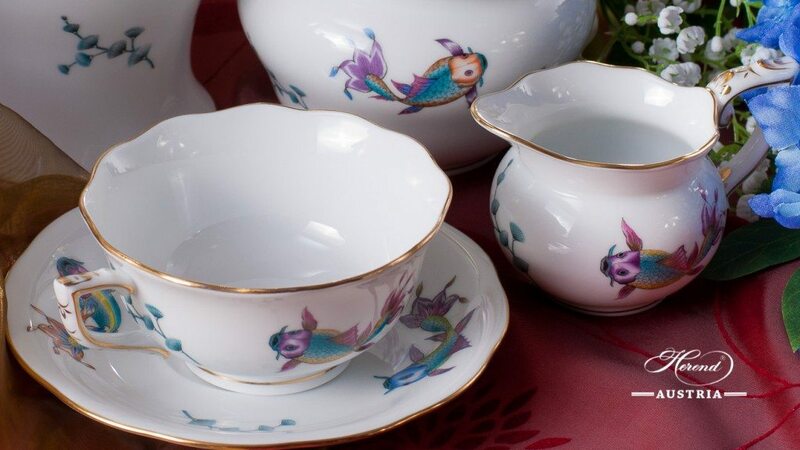 Its leading motive is a stylised Fish painted in Various Shades of Pastel. 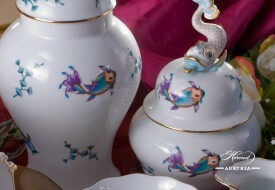 An ancient Symbol of Affluence and Wealth in China and many other countries of the Far East, Fish, mainly Gold Fish – subjects of multiple interpretations and often used as ornaments – are ancient, mythic, and much preferred animals. 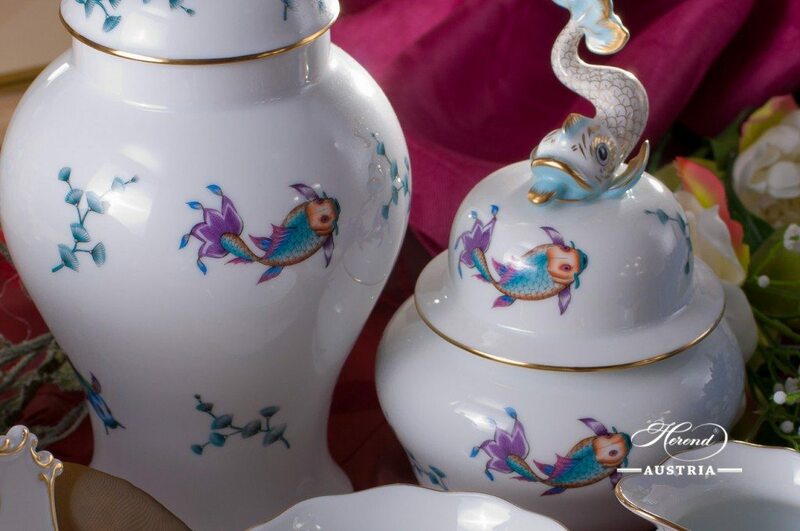 Fish are often depicted as Life-Savers or symbols of fertility, and even a Magic Force is attributed to them. 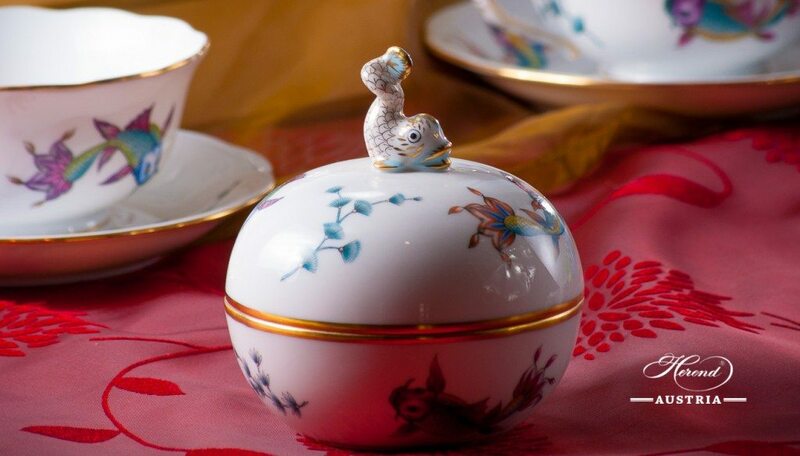 The Herend Ornament uses the Symbol of Richness among stylised seaweeds – among seaweeds, which in the swarming water could be obstacles to fish, for example. 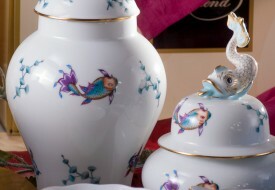 This is why a hidden meaning, evoking memories of protective warning, signifies that Wealth and Richness might also entail difficulties, while decoration – stressing the tradition of artistic craftsmanship using the technique of painting by hand – stands for Herend’s real Treasury: the Craftsmanship and Skills of its Painters. 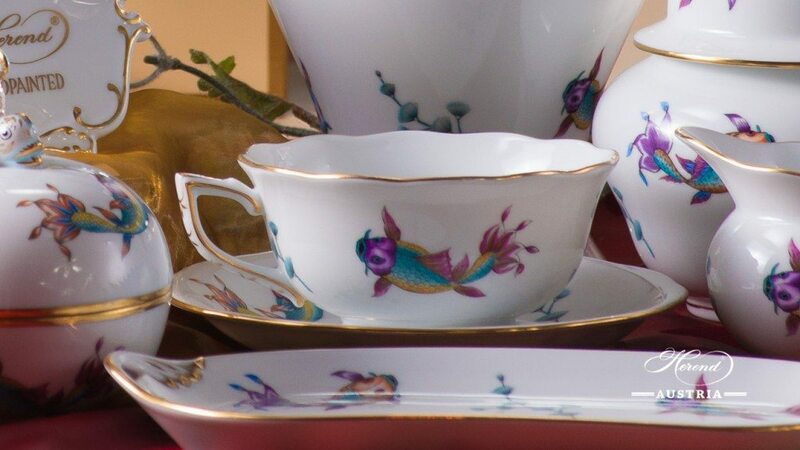 What kind of Colored Fishes Herend sets do we have? 1 pc. Teapot 8 dl. 1 pc. Sugar-Bowl 1,5 dl. 1 pc. Creamer 1,2 dl. 2 pcs. Teacup 1,8 dl. 1 pc. Coffeepot 8 dl. 1 pc. Milk-Jug 1,2 dl. 2 pcs. Coffeecup 1,8 dl. 1 pc. Mochapot 8 dl. 2 pcs. Mochacup 1,8 dl. 2 pcs. Soup Plate 3 dl. 6 pcs. 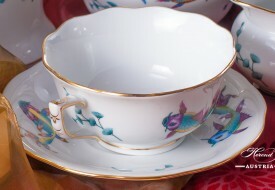 Teacup 1,8 dl. 6 pcs. Coffeecup 1,8 dl. 6 pcs. Mochacup 1,8 dl. 6 pcs. Soup Plate 3 dl. Send us a message! Or Send us your phone number and we will call you back! The Hunting Trophies Herend Service is mainly decorated with Trophies of Animals from the Forest and Fields of Europe. 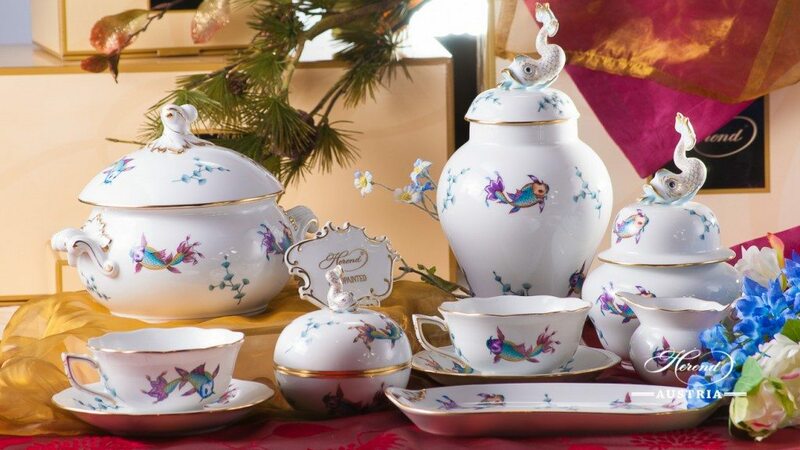 You can see Deer, Fox, Wild Boar and Mouflon, along with Pheasants, Grouse and Partridges trophies on all the items surrounded with green grass and forest plants. 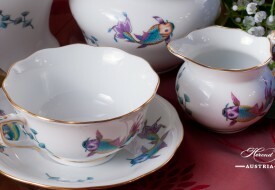 Dinner, Tea, Coffee and Mocca Sets are available. Vienna Rose platinum is the redesign of the original Vienna Rose green. Using platinum ornaments and light grey elements, it symbolizes elegance and modern luxury at once. 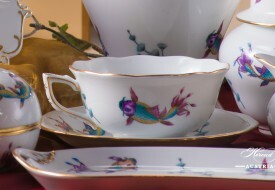 Rose blossoms enforce the beauty of the classical Herend design. 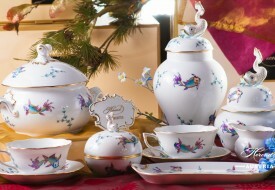 The Victoria avec Bord en Or (VBO) Herend Service is a child design of the original VICTORIA Herend pattern. 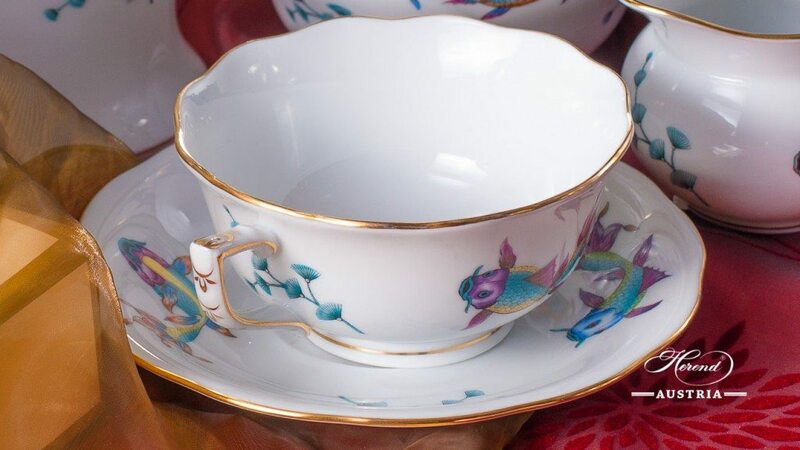 VICTORIA pattern was presented in England 1851 where it won the “Golden Prise” and Queen Vicoria of England ordered it for her Castle at Windsor.This is a modern version of the original, with lighter colours and dominant Gold edges. Couple of Birds Décor with Blue Fish-scale is a version of edge to the original decor RO. More than 15 types are available depending on the colour of Fish-scale. The first was made shortly after the introduction of the original RO pattern in the 1860’s. 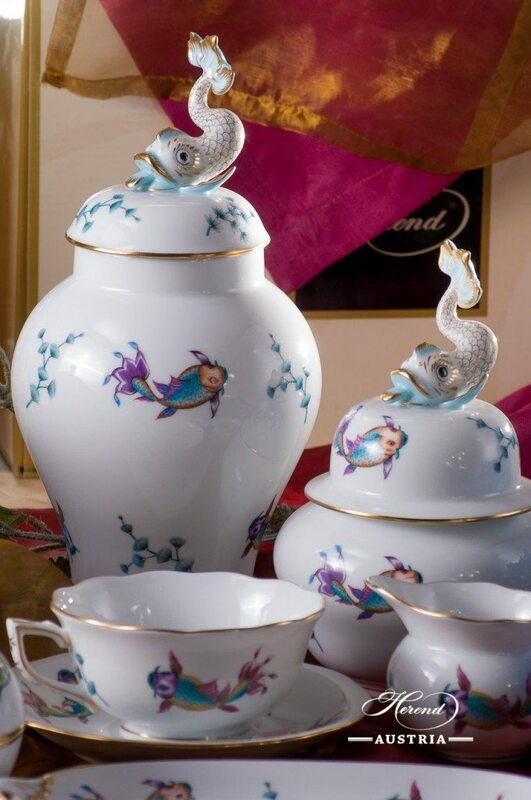 RO-ETV Decor is available as Tea Sets, Coffee Sets, Mocca Sets and Dinner Services. 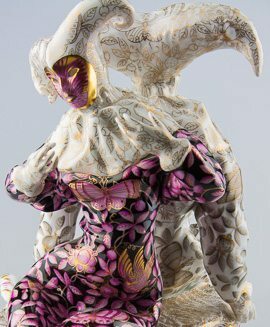 The Nyon (NY) Services was inspired by the artifact found close to the city of Nyon. An antique pot painted with the flower Morning Glory the first time. An exclusively Elegant Décor painted with blue flowers with green leaves and Golden rim. 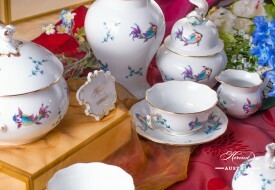 Tea Sets, Dinner Services, Coffee Sets, Mocca Sets and Special forms are available. The Vienna Rose or Habsburg Rose Herend Services are originated from an old design from Vienna since 1862. This Décor is present in the Habsburg Court. This is a real Biedermeier design. Decorated with the so called Habsburg Rose. 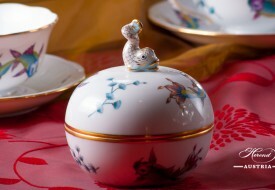 Original name is “Vieille Rose de Herend”. Available in Tea, Coffee, Mocca and Dinner Services.